How many Ecosavr™ do I need? 1 Ecosavr™ will cover a 400 square foot pool (a pool with approximately 15,000 gallons of water) for about a month. Should I use Ecosavr™ if my pool ISN'T heated? 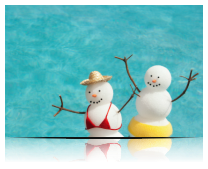 You should absolutely use Ecosavr™, even if your pool isn't heated! A heated swimming pool should see financial savings by using Ecosavr™, since they won't be using as much water to keep their pool temperature maintained, but there are other benefits to using Ecosavr™, as well. Ecosavr™ has been proven to reduce overnight heat loss by about 50%, so if you are not heating your pool, you will be able to keep your water warmer, for a longer period of time. As an added bonus, Ecosavr ™will also lower your water loss, so you won't have to refill your pool as often! Can I use Ecosavr™ if I have a Salt water generator? Yes, you can use Ecosavr™ if you have a Salt water generator. It is also safe for all your other pool chemicals and equipment, including filters. Why did the blue liquid inside my Ecosavr™ turn clear? Occasionally, a bit of pool water will get inside your Ecosavr™ fish when it is in your pool. The sanitizing agents you use to keep your water clean will cause the tiny amount of food-grade die used in our Heatsavr™ formula to turn clear. Don't worry, the active ingredient is still doing its job, covering your pool and keeping the heat in! Do I need a higher "initial" dosage? If you are putting in your very first Ecosavr™, you may want to squeeze a bit of the liquid directly into your pool before letting it sink to the bottom. This is not a necessary step, but it will make sure that the liquid pool cover starts to work within minutes! You'll only need a few drops, and then you can let the Ecosavr™ sink to the bottom of your pool to keep the cover replenishing consistently throughout the rest of the month. Should my Ecosavr™ float? Or sink? Ecosavr™ should always sink to the bottom of your pool in order to work effectively. Watch the video above, for a short instructional showing you how to get your Ecosavr™ to sink properly! Once it is in your pool, the water pressure and the fact that the Heatsavr™ liquid inside each fish is lighter than the water in your pool, will ensure that the liquid cover rises to surface. It will then spread itself out - just like putting a physical cover on your pool, only much easier! What if my pool vacuum gets ahold of Ecosavr™? If having a small fish at the bottom of your pool disturbs your pool vacuum, you can also put the Ecosavr™ in your skimmer basket. If it is a bit too big, just fold the tail in a bit. As long as the entire fish is submerged in water, it will work great! Can Ecosavr™ be used on an above -ground pool OR an in-ground pool? One of the greatest things about liquid pool covers is that they can form themselves to any size or shape of swimming pool.